Results from a new study by physicists with the Lawrence Berkeley National Laboratory provide experimental support to the theory that interactions between electrons are critical to graphene’s extraordinary properties. Perhaps no other material is generating as much excitement in the electronics world as graphene, sheets of pure carbon just one atom thick through which electrons can race at nearly the speed of light – 100 times faster than they move through silicon. Superthin, superstrong, superflexible and superfast as an electrical conductor, graphene has been touted as a potential wonder material for a host of electronic applications, starting with ultrafast transistors. For the vast potential of graphene to be fully realized, however, scientists must first learn more about what makes graphene so super. The latest step in this direction has been taken by researchers with the U.S. Department of Energy (DOE)’s Lawrence Berkeley National Laboratory (Berkeley Lab) and the University of California (UC) Berkeley. 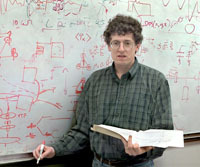 Michael Crommie, a physicist who holds joint appointments with Berkeley Lab’s Materials Sciences Division and UC Berkeley’s Physics Department, led a study in which the first direct observations at microscopic lengths were recorded of how electrons and holes respond to a charged impurity – a single Coulomb potential – placed on a gated graphene device. The results provide experimental support to the theory that interactions between electrons are critical to graphene’s extraordinary properties. Crommie is the corresponding author of a paper describing this study published in the journal Nature Physics. The paper is titled “Mapping Dirac quasiparticles near a single Coulomb impurity on graphene.” Co-authoring this paper were Yang Wang, Victor Brar, Andrey Shytov, Qiong Wu, William Regan, Hsin-Zon Tsai, Alex Zettl and Leonid Levitov. Graphene sheets are composed of carbon atoms arranged in a two-dimensional hexagonally patterned lattice, like a honeycomb. Electrons moving through this honeycomb lattice perfectly mimic the behavior expected of highly relativistic charged particles with no mass: think of a ray of light that is electrically charged. Because this is the same behavior displayed by highly relativistic free electrons, charge-carriers in graphene are referred to as “Dirac quasiparticles,” after Paul Dirac, the scientist who first described the behavior of relativistic fermions in 1928. 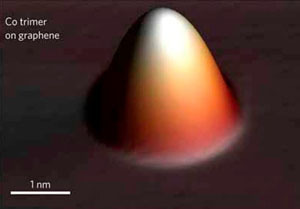 Working with a specially equipped scanning tunneling microscope (STM)in ultra-high vacuum, Crommie and his colleagues probed gated devices consisting of a graphene layer deposited atop boron nitride flakes which were themselves placed on a silicon dioxide substrate, the most common of semiconductor substrates. 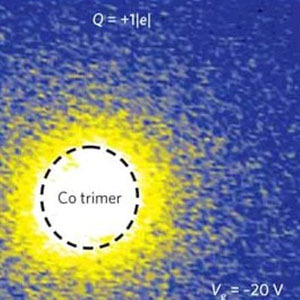 The STM used to fabricate the cobalt trimers was also used to map (through spatial variation in the electronic structure of the graphene) the response of Dirac quasiparticles – both electron-like and hole-like – to the Coulomb potential created by the trimers. Comparing the observed electron–hole asymmetry to theoretical simulations allowed the research team to not only test theoretical predictions for how Dirac fermions behave near a Coulomb potential, but also to extract graphene’s dielectric constant. This research was supported by the DOE Office of Science, the Office of Naval Research, and the National Science Foundation. Be the first to comment on "Electron-Electron Interactions are Critical to Graphene’s Extraordinary Properties"